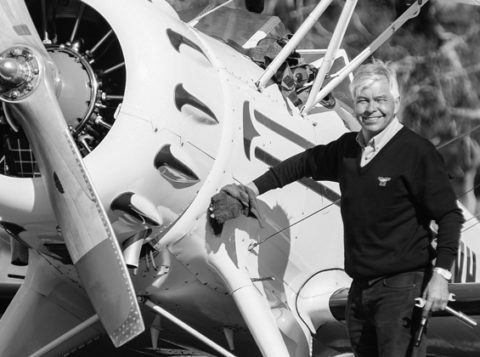 Martyn Smith is every part the quintessential aviation fanatic. He is passionate about flying but so too about air safety. He revels in being alone in the air but similarly delights in inspirationally presenting his own personal sky to others. He thrives on the excitement, adrenalin and buzz that extreme piloting can deliver but is even more motivated by gently introducing a newcomer to the joys of flight. And he is, above all else, totally committed to sharing his love affair with aeroplanes to as many people as possible. In short, Martyn is the consummate aviation professional, for whom flying is nothing short of an addiction as well as an absolute and delightful way of life. 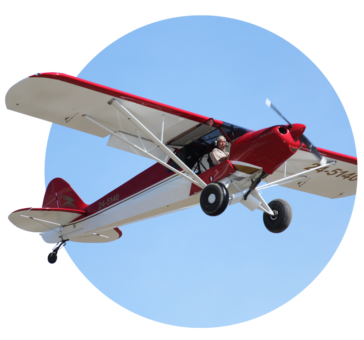 Beginning his now long standing devotion to flying in the early 80’s, Martyn’s initial steps into aviation were as an ardent amateur with microlights and then light aircraft. Quickly gaining his Commercial Pilot Licence, his first professional assignment was at the helm of a classic 1949 designed De Havilland Heron with its four Gipsy Queen engines driving their two bladed, variable pitch propellers. His next career, first working on passenger aircraft, was with Air UK, a UK based Airline. That put Martyn in the right hand seat of their high wing Fokker F27’s, one of the world’s most successful twin turboprop airliners. It was also in the co-pilot’s seat, and again for European holiday travellers, that Martyn transferred to the BAC 1-11 turbojet airliner. From there, on to the late comer of the McDonnell Douglas MD-80 fleet, and Martyn’s favourite aeroplane, the MD 83. Indeed, it was with these MD 83’s, with a mere 2,800 hours under his belt, he took his first command. Next, moving to the start up airline, Airtours International, Martyn was appointed Training Captain with key responsibilities for the crew of MD 83’s, and subsequently Boeing 757-200’s and 767-300’s. His own flight commitments, during this 13 year period, taking him to all sectors of his company’s global service. Enjoying the challenges of start-up operations, Martyn finally accepted the role of Chief Training Captain for the 757 fleet of international operator FlyJet, a role which he fulfilled until November 2004. With 12,800 hours to his credit and drawing this phase of his aviation career to a close, Martyn and his family elected to move to his wife’s home country, Australia.